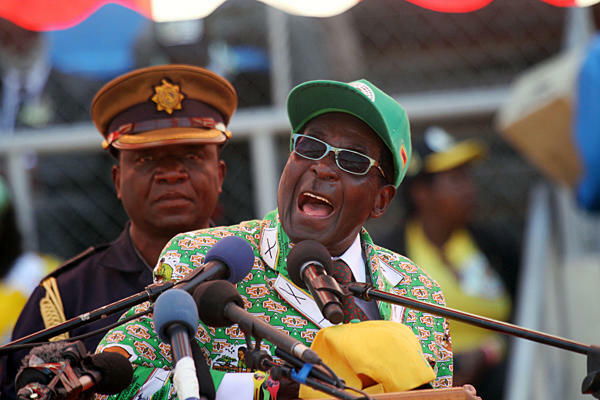 HARARE, Zimbabwe — Zimbabwe’s leader, Robert Mugabe, faced one of the biggest challenges to his 33-year grip on power in elections Wednesday that were marked by scattered allegations of voting irregularities. Zimbabweans voted in large numbers despite concerns about the credibility of the electoral process, and the vote was relatively peaceful compared to disputed and violent polls in 2008. Some election observers noted cases of registered voters being turned away from the polls. There have been worries about oversights in the hasty preparations for the vote, as well as fears of alleged vote-rigging of the kind that occurred in past elections. Tendai Biti, the third-ranking official in the former opposition party of Prime Minister Morgan Tsvangirai, Mugabe’s popular challenger, reported alleged irregularities across several districts, including changes to voters’ lists and ballot papers. But “we are encouraged by the high turnout. We remain confident in spite of all these challenges,” Biti said late Wednesday. Activists believe a big turnout is likely to favor Tsvangirai, by blunting the impact of any manipulation of voters’ rolls. Mugabe, who barred Western observer missions, says allegations of vote-rigging amount to mudslinging by opponents. Judge Rita Makarau, head of the official election commission, reported what she called “a few minor logistical problems” where voting started slowly, and appealed to people to put forward any evidence of voting irregularities. Voting may be extended to a second day Thursday, according to election officials. Final tallies are expected by Monday. Kadhashu Makanyanya was one of those who was unable to vote after he was told his name was not on the voters’ role. The Zimbabwe Election Support Network, an observer group, said it had observed potential voters with registration slips being turned away from the polls. Bundled against the winter chill, thousands of voters stood patiently in long lines in the poor Harare township of Mbare and other areas. Some wary voters said they would bring their own pens into the voting booth after hearing rumors that the ink in state-provided pens would disappear after several hours, enabling ballot manipulation. Ten public buses from South Africa carrying expatriate voters from Tsvangirai’s Movement for Democratic Change party were impounded at the border to Zimbabwe, said party member Gilbert Maganda. Mugabe, 89, has said he would step down if he loses. Many Zimbabweans find it hard to believe that the wily politician, a former guerrilla who led the country to independence in 1980 and has the backing of the security forces, would relinquish control even if the vote doesn’t go his way. After voting in Harare’s western Highfield township, Mugabe said he expected to be re-elected. “We will have lots of things to do to get our economy back on its feet,” he said. Tsvangirai, who had been in an uneasy power-sharing arrangement with Mugabe, cast his ballot in northern Harare. “We have come to complete the change we have always fought for,” he said. “It is an emotional moment for me but I am filled with a sense of calmness.” The coalition between the two rivals was forged by regional leaders after Zimbabwe’s last disputed election in 2008. Zimbabwe’s shaky government was effectively dissolved on Wednesday; Mugabe and Tsvangirai have each predicted outright victory that would avoid the formation of another coalition. Half the population of 12.9 million is eligible to vote. The state election body has said administrative, logistical and funding problems hindered voting arrangements, but said the problems have been fixed at the more than 9,000 polling stations nationwide. The International Crisis Group, a research organization, said it fears a return to a protracted political crisis and possibly extensive violence if the Zimbabwe poll is inconclusive and disputed. Wednesday was a public holiday because of the vote. In Mbare township, the lines were moving smoothly with ballots being cast at an average of five minutes for each voter in the three votes for president, lawmakers and rural and urban council officials. Many voting lines were dominated by young voters and women. Rural voters in Mugabe’s traditional strongholds also formed long voting lines, witnesses said.